Our people are the key to Advanced Cable Technology’s success. Our personnel have achieved a high level of training and certification in all aspects of assessment, planning, design, engineering, installation, and ongoing services for voice, date, and video. Our on-going comprehensive training programs provided by BICSI, equipment manufacturers and industry specialists, ensures that our staff is current and knowledgeable in the latest technology advancements and services. Our certifications can be seen here. BICSI membership and training program. BICSI, Registered Structure Cabling Installation. Lucent Systemax Structured Cabling Systems ND3341. Lucent Category 5 Handling, patch panel termination, modular jack. Ortronics Installer Certification on open systems architecture. Siecor TR-07-S+ Single-mode Multimode LAN WAN Certified. Siecor TR-02 Premise Fiber Installation. 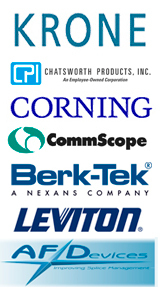 Leviton Fiber Optic Systems Certified. Leviton Installers Certificate for extended warranty. AMP Net Connect Distribution Designer certification 396030-1. Siemen Category 6 Premise Cabling certificate. 03-06-00 Micron Internet Services-Black Eagle Center Boise, ID. 10-05-01 Twin Falls School Dist. Installed cameras and DVR systems in 11 schools. 11-15-01 Ballard Medical Bldg. Pocatello, ID. Installed new fire alarm system. 01-10-04 Carpet One Boise, ID Network/Telephone System Cabling.